My family has been making flat enchiladas for as long as I can remember. The story is that my grandma brought them with her from New Mexico. 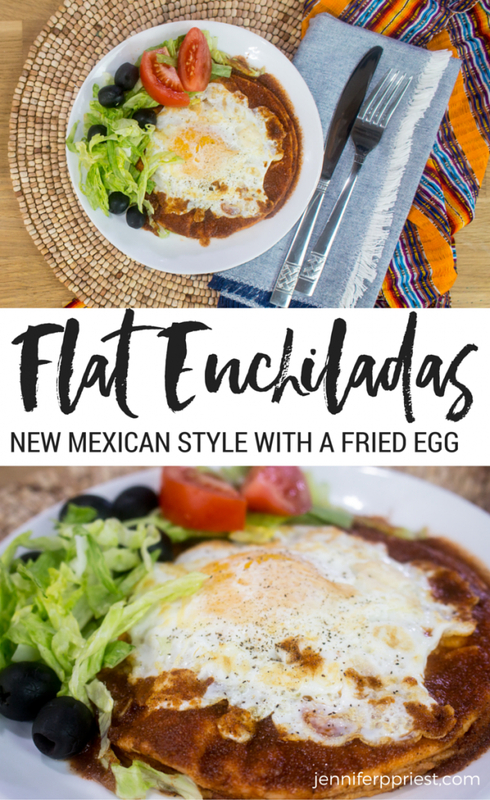 That's why these are called New Mexican Flat Enchiladas. 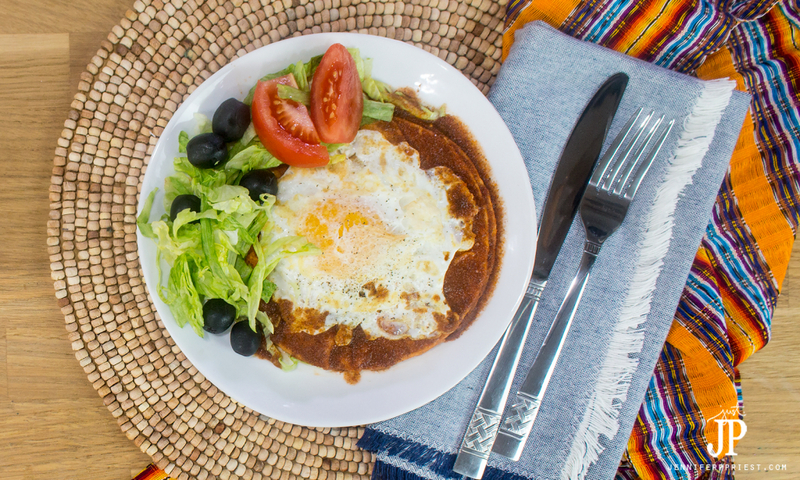 A fast, easy meal, this enchilada dish was one of my dad's favorites. My family loves it too! 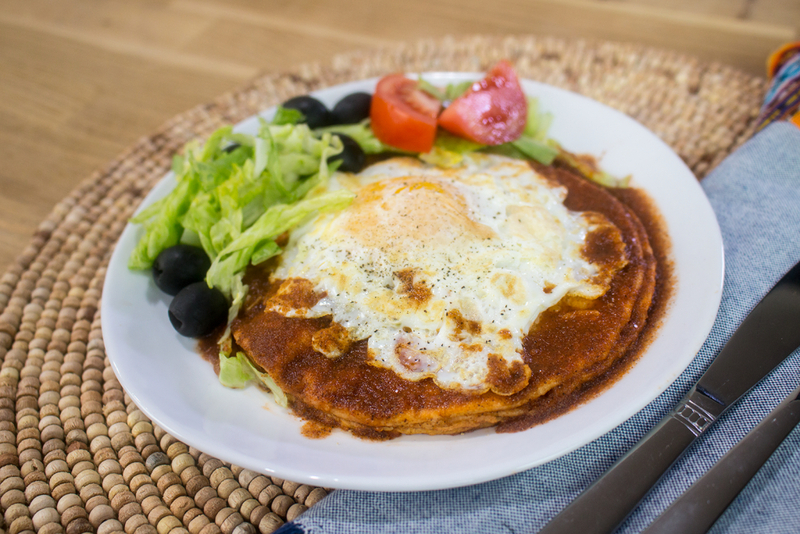 Stop rolling enchiladas – after you make this, your enchilada world will be rocked! Since I went mostly grain-free, there are a few adjustments I have made to the recipe from the version my mom makes, the main one being that I do not thicken the enchilada sauce with flour since I don't have flour in my house. We used to brown flour in a bit of oil in a sauce pan and then add a large can of enchilada sauce. The problem with canned sauces is that none of them ever tastes that good because, well, grandmas didn't use canned sauce back in the day! My husband researched sauces and I told him yay or nay on the ingredients. No, we don't need flour. No, we're not adding vinegar – that's just weird! We also skipped frying the tortillas before putting them in the sauce, another part of the recipe that my grandma did. Through trial and error we created a new enchilada sauce that is flavorful, gluten-free, and easy to make with Knorr Caldo de Tomate Bouillon (Tomato Bouillon w/ Chicken Flavor). To make this enchilada sauce, you'll need the following ingredients, all of which you can find at your local Walmart. Be sure to get Knorr Caldo de Tomate Bouillon (Tomato Bouillon w/ Chicken Flavor) because this will make all the difference in the flavor of the sauce. Authentic and easy enchilada sauce recipe. Prepare the Knorr Caldo de Tomate Bouillon (Tomato Bouillon w/ Chicken Flavor) in 2 cups of hot water. Add spices. Cook for 1 minute, stirring constantly. Stir until lumps are gone. Cook on medium-high heat until thickened, about 7-10 minutes. Use this sauce for any enchiladas recipe. Fast and flavorful, this recipe will quickly become your go-to meal when you don't know what's for dinner. 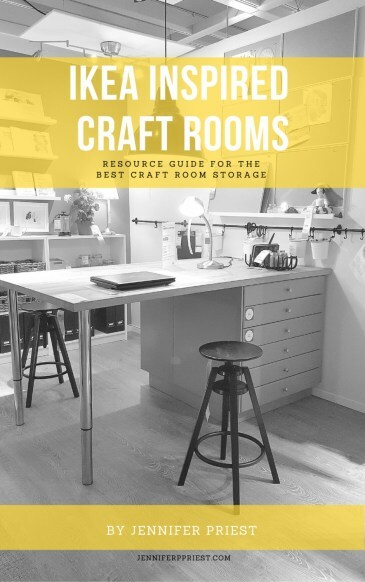 This recipe is for a single person so you can adjust it to fit any size family easily. Delicious New Mexico style stacked enchiladas. Heat the enchilada sauce in a sauce pan on medium heat, until it begins to bubble. Add one tortilla to the pan at a time. Cook for about 1 to 2 minutes, until heated through. Remove the tortilla from the pan and place in the center of a ceramic, oven-safe plate. Sprinkle shredded cheddar cheese and diced onion on top of the tortilla. Repeat the process with the next tortilla. Continue stacking the tortillas, onions, and cheese until the final tortilla is on the stack. An adult male can eat 3-4 tortillas in a stack. Do not top the final tortilla with cheese and onion. 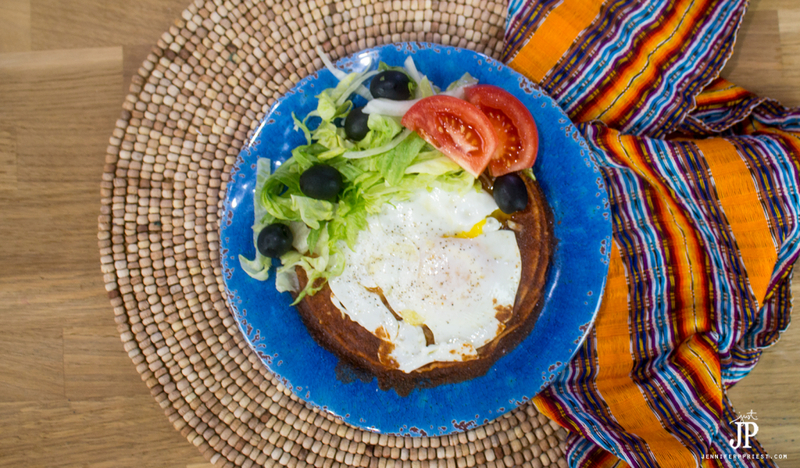 Fry an egg and place on top of the tortilla stack. 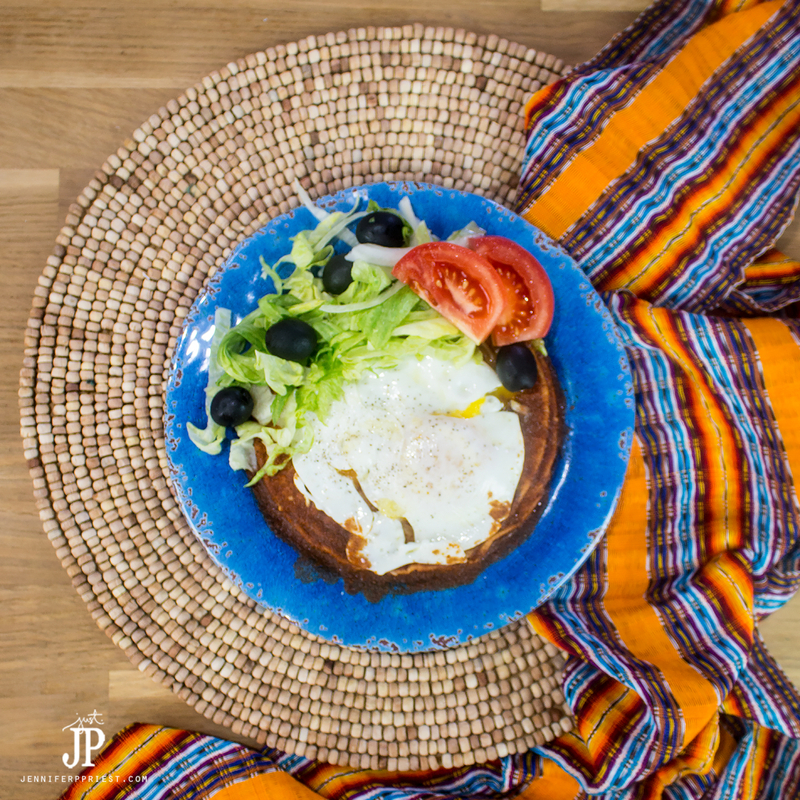 While frying the eggs, keep the plates of tortillas warm in an oven set to 200ºF. If you're cooking for 1 or 2 people only, no need to keep the tortillas warm in the oven. Spoon extra sauce onto the stack if the tortillas look dry. Surround the stack of tortillas with lettuce, tomato, and olives. Next time you need to make dinner quick, try these recipes! Be sure to always keep Knorr Caldo de Tomate Bouillon (Tomato Bouillon w/ Chicken Flavor) in your pantry to make everyday dishes, like this one, more flavorful and easy to make any time. Do you have a special way of making enchiladas? Let me know in the comments! PIN this post to SAVE this recipe! My grandmother was raised in Las Cruces, NM. I grew up eating these enchiladas. We did fry the tortillas and used Las Palmas Enchilada Sauce. I never liked the egg on mine when I was little. Thanks for sharing your recipe. More people need to know the joy of New Mexico enchiladas. Oh that sounds sooooo good!!! Makes me homesick. I’m from southern New Mexico, too, and this looks like the real deal. Mouth is watering. We bought canned enchilada sauce, sometimes just poured it (heated) over saltine crackers and topped it with cheese for a snack! 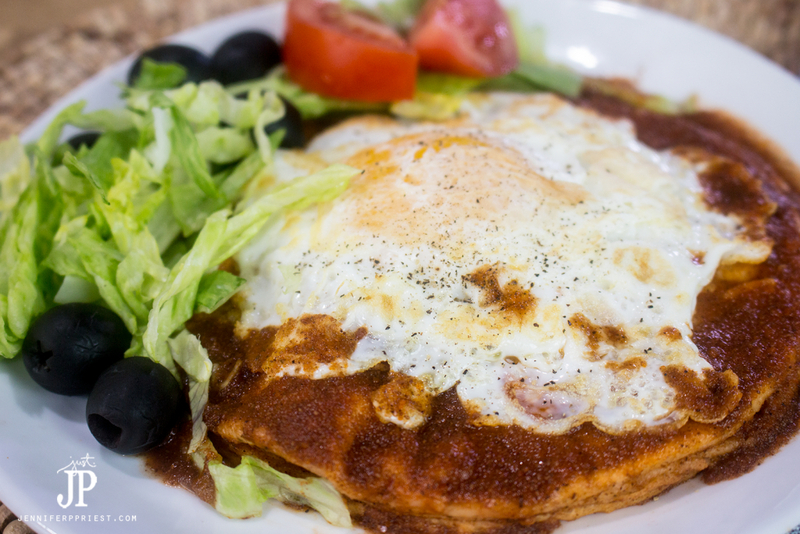 We always had fried eggs on our enchiladas but when ordering enchiladas in Arkansas, we asked for an egg on top, and they served it with a hard-boiled egg–what?!! A friend made her sauce from scratch with red chili pods, boiled, put in blender, then the pulp sieved out, and of course homemade corn tortillas. Oh my gosh, the best. I recently tried a Mexican rice recipe that called for the Caldo de Tomate, and it was exactly right. I am printing out this recipe to try for sure. Thank you, Jennifer! for those that need to be gluten free this bouillon contains barley which can really hurt if you are Celiac gluten free. My Mother in law was from Mexico and these enchiladas remind me of hers, so good! !